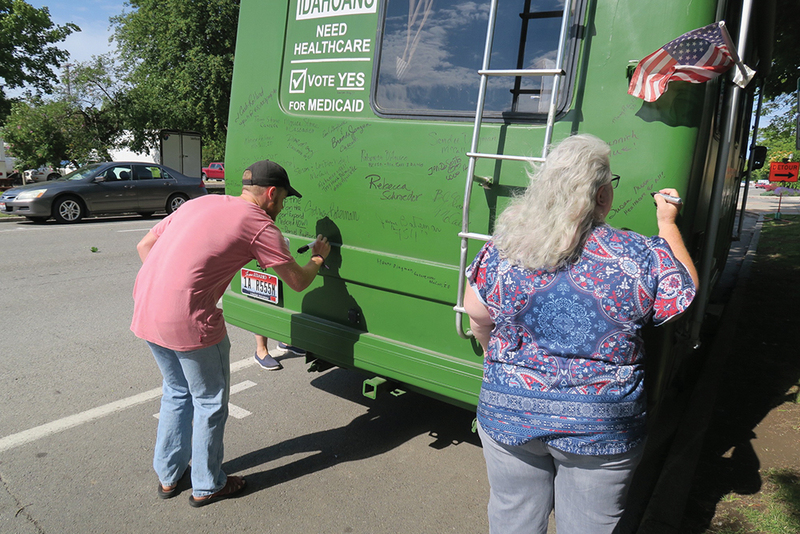 A couple Sandpoint residents sign the Reclaim Idaho RV before it left for Boise on Thursday morning. Photo by Ben Olson. “The ballot measure would provide a healthcare solution for thousands of single parents, near retirees, rural residents and all hard-working Idahoans who earn too much to qualify for Medicaid and too little to afford coverage on the state’s health insurance exchange,” said Idahoans for Healthcare in a statement Friday. 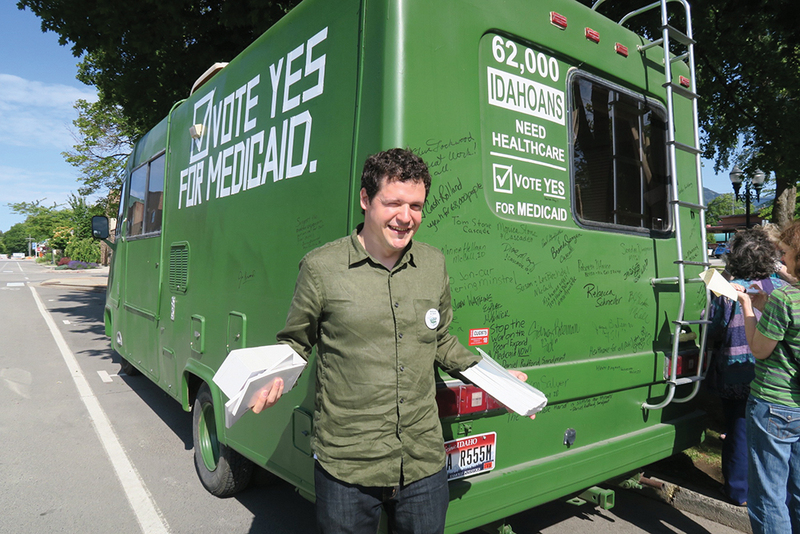 The group is a coalition of healthcare providers, business leaders, community organizations and grassroots activists looking to expand Medicaid in Idaho. Idahoans for Healthcare also revealed its chairs at Friday’s gathering: Republican state representative Christy Perry and Reclaim Idaho leader Emily Strizich. The group said that combination of leadership highlights the bipartisan effort behind the ballot initiative. “This isn’t a political issue. It’s a human issue,” Perry said. Strizich and her husband, Garrett, as well as Luke Mayville, are the leading voices behind Reclaim Idaho, the grassroots campaign that led the charge for signatures over the last year. 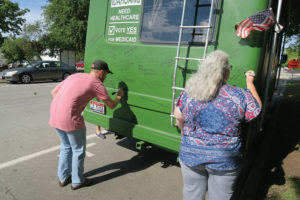 Garrett and Mayville hail from Sandpoint, where they made a stop Thursday to speak with locals about the ballot initiative. Luke Mayville getting ready to pass out materials before hitting the road for Boise Thursday morning. Photo by Ben Olson. Reclaim Idaho joins a number of other state organizations under the Idahoans for Healthcare banner, including Idaho Medical Association, Idaho Primary Care Association, Idaho American Cancer Society, American Academy of Emergency Physicians, Idaho Academy of Family Physicians, Idaho Voices for Children, the Consortium of Idahoans with Disabilities, the Idaho chapter of the American Academy of Emergency Physicians, the Idaho chapter of the American Heart Association and the Idaho chapter of the American Lung Association. Local climber aims to bag all 66 ‘14er’ peaks in contiguous U.S.